Suitable for work and relaxation (games, TV series, movies, browsing the internet, breakfast in bed). NOTE: Kapoo Laptop desk make your life convenient and comfortable. Just enjoy your life. Don't hesitate! Add to your CART and BUY at this moment! 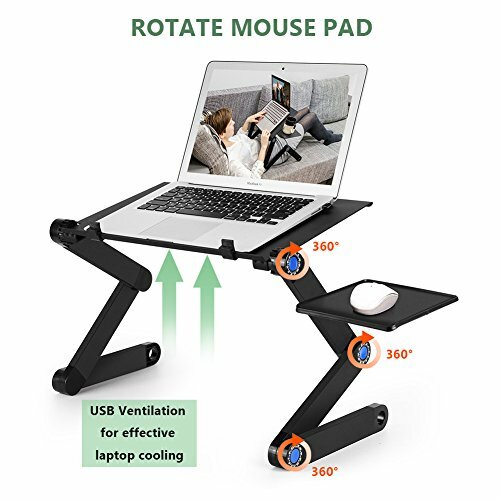 ★ 2 CPU COOLING FANS- With Dual Ventilation Fan which provide strong air flow to dissipate the heat from bottom of your notebook. Not only a table but also a cooler. ★ MULTI-FUNCTIONAL - Computer desk, writing desk, sketchpad, board, dining table, flower Stand etc. The use of occasions: bed, sofa, table, carpet, meadow, desk etc. Object: adults, children and all the crowds. ★ HIGH QUALITY MATERIAL - Table size 16.5*10.23 Inch (27 X 42cm). Idea for 7"-17" LAPTOPS, iPads and other gadgets, books. Very lightweight - 3,5Lbs (1,5kg), made of high quality aluminum alloy, compact, foldable and easy to carry. ★ 360 DEGREE ADJUSTABLE - Each folding leg has 3 knobs which can adjust and lock in any height and angle you need. 360°revolve provides the high flexibility just as human. Adjust height from 1,5 to 19 Inch (4 to 48cm). ★ SELLER WARRANTY - 12-month replacement warranty, 30-day money back guarantee. View More In Desks & Workstations. If you have any questions about this product by Kapoo, contact us by completing and submitting the form below. If you are looking for a specif part number, please include it with your message. Need Computer Desk Office Desk Folding Table with BIFMA Certification Computer Table Workstation, White AC5DW-120, 47"